Naturalists look to nature for a sense of what seems important and real. Part of this is practical, as nature provides the air we breathe and the food we eat and sets the bounds in which we live. Another part is emotional, where encounters with nature can give a sense of beauty and connection. Ralph Waldo Emerson, Henry David Thoreau, John Muir, and many others have looked at nature as a central part of a spiritual sense. In a number of views, nature is seen as sacred. A focus on nature shows how, in ecosystems, forms of life all depend on one another. As the human population has expanded and many habitats have been destroyed, questions about our relation to other creatures and our place and role in the world are being looked at with fresh eyes. For many religious naturalists, ecology is a goal and ideal and focus for action. In this, as in responding to the traditional religious mandate for stewardship of the Earth, a religious sense adds to practical reasons to work toward images of Thomas Berry and others – of greater preservation, balance, and regard for nature in a potential future Ecozoic era. Thomas Berry. The Meadow Across the Creek. Donald Crosby. 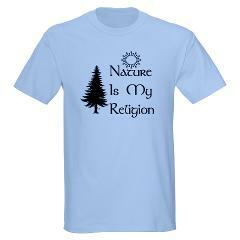 A Religion of Nature. Carl Von Essen. Ecomysticism: The Profound Experience of Nature as a Spiritual Guide. Mike Comins. A Wild Faith: Jewish Ways into Wilderness, Wilderness Ways into Judaism. Richard Louv. Last Child in the Woods: Saving our Children from Nature Deficit Disorder.